Welcome to our Resources page! We are delighted to share with you the following list of materials suggestions used to make Temari. 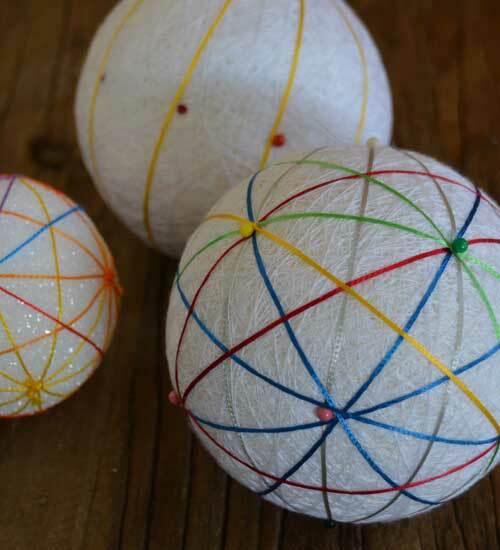 Many of the materials used today for wrapping Temari balls are often not the traditional materials used in Japan. Accessible substitutes have been found that work very well. Living in a subtropical climate, I use synthetic materials that do not invite bugs or moths. It takes about 20 minutes to wrap a ball, from start to finish, using a Styrofoam ball and synthetic materials listed below. Balls are washable when wrapped in suggested synthetic materials, depending upon your pattern threads. But most of those are washable too. Another benefit of using a Styrofoam ball is that they are lightweight. The following ball sizes conform to traditional Japanese Temari patterns. Compare yours below. 2.5-inch diameter Styrofoam ball wrapped measures approx. 23 cm. 3-inch ball wrapped measures approx. 26-27 cm. 4-inch ball wrapped measures approx. 33.5 cm. 5-inch ball wrapped measures approx. 42 cm. IMPORTANT: Check balls carefully when purchasing for flat spots and imperfections. The batting should be 1/4th to 1/2 inch or 1 cm thick, needled batting with consistent thickness and texture throughout. For dark color wraps, I typically use Black batting. 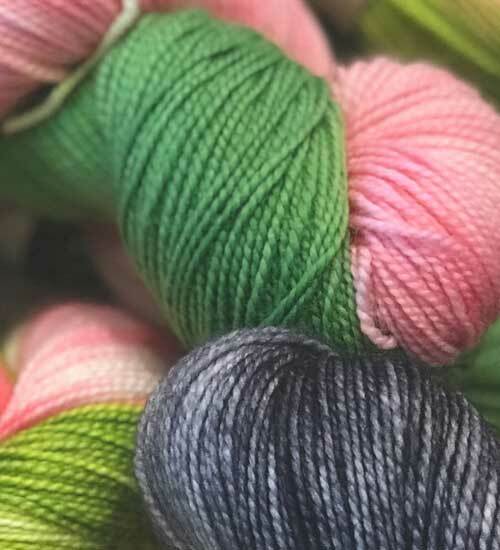 For light color threads, use white batting. My preferred batting comes from The Warm Company – Soft and Bright. You may want to Google black batting or look on Amazon for black. Black polyfil-cotton blend is OK.
Yarn color should be similar in color to outer thread wrap layer (next step). Lightweight fine acrylic with a crimp works best. Knitting machine yarns on cones work well for a few colors – black, red, white – your most frequently used colors. Look for machine knitting products. Look on Amazon and E-bay for acrylic needle-punch yarns in a variety of colors. Pretty Punch or Cameo are two brand names. 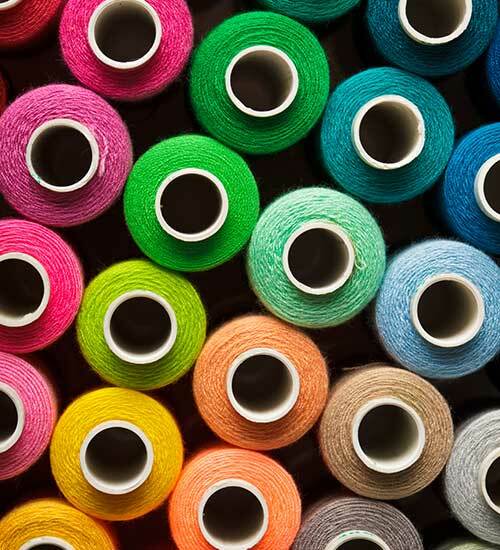 Cotton or polyester regular sewing thread – the cheaper the better. High quality threads are treated with sizing which is great for your sewing machine but too slick for Temari. Threads slide right off the ball. Do not use rayon machine embroidery thread. Coned polyester serger threads work great. DMC Machine Embroidery Cotton Thread is color-keyed to DMC Pearl Cotton and is superb. The following tools are essential in creating your Temari ball. They may be purchased at your local craft or sewing stores. NEEDLES – DMC #18 – 2.5 inch Yarn darners are easy to find in most fabric and craft stores and very good for Temari. Clover’s Sashiko needles are superb when you can find them. Dritz Doll Needles are good for 5-inch and larger balls providing a longer reach under the surface. COLOR HEAD PINS – plastic and or glass, in as many different colors as you can find. Nobody obsesses over pins like Temari makers. Length should be about 1.25 inches. Small size pins in colors are good for tiny measurements. 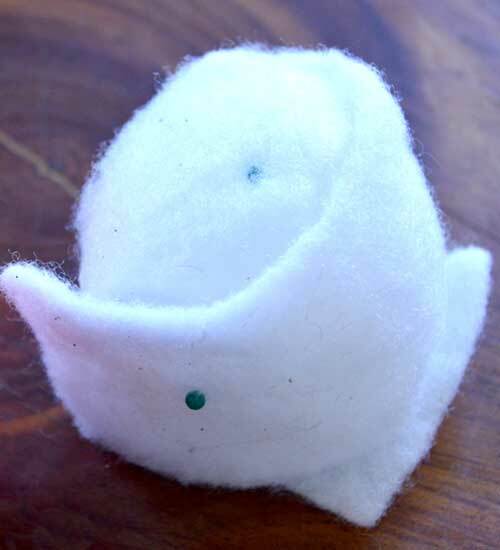 A few “Number” pins, i.e., #1-10, can be helpful and a few quilters’ Daisy pins. PINCUSHION – of your choice. FABRIC SHEARS – for cutting batting. SMALL THREAD SCISSORS – the Japanese ones work best -called Thread clips – 4.1-inch length and make you ultra cool. Find them at www.scissors.jp. They are worth every penny and never wear out. If you’re in Kyoto, look for a Nomura’s Tailor House. They have an overwhelming array of threads, notions, and more. CENTIMETER TAPE MEASURE – the narrower the better. HEMOSTAT – a helpful tool to pull your needle through a tough spot. MEASURING PAPERS – quilling paper works great – 3/8 inch wide; colors don’t matter. Length matters. Look online or in your favorite craft store. Or cut your own – 20 lb. bond copy paper cut on a paper cutter for 3-inch balls. 4-inch balls use legal size. DMC and Anchor brands are the easiest to find. Use an online conversion chart between these two. They are available in most craft stores. FINCA brand has slightly different and beautiful colors. They are available in specialty needlework shops. COSMO and OLYMPUS brands from Japan are excellent. Most of my Temari career has been spent teaching. I am very fortunate to have been invited to teach in some of California’s nicest needlework shops with a full range of materials. Consequently, experimentation quickly jumped to the fore. We learned what materials were optimal and which were not. Available are wonderful fibers of bamboo, silk and rayon, metallics in a rainbow of colors, and flat-woven ribbons in metallics, silk, and rayon.